Do you know where the water should go? The storm drain system is designed to prevent flooding by carrying excess rainwater away from streets... it is not designed to be a wastewater disposal system. Since the storm drain system does not provide for water treatment, it often serves the unintended function of transporting pollutants directly to our waterways. Unlike sanitary sewers, storm drains are not connected to a treatment plant - they flow directly to our local streams, rivers and lakes. Soaps, degreasers, automotive fluids, litter, and a host of other materials washed off buildings, sidewalks, plazas, parking areas, vehicles, and equipment can all pollute our waterways. Non-stormwater discharges such as washwater generated from outdoor pressure washer cleaning projects often transport harmful pollutants into storm drains and our local waterways. Polluted runoff contaminates local waterways and poses a threat to groundwater resources. Since stormwater pollution prevention is much easier, and less costly that cleaning up "after the fact" the Cities and County CleanWater / StormWater Pollution Plan informs residents and businesses of stormwater pollution prevention activities such as those described here. The Cities and County have adopted ordinances for stormwater management and discharge control. In accordance with the state and federal law, these local stormwater ordinances prohibit the discharge of power washer wastes into the storm drain system or local surface waters. 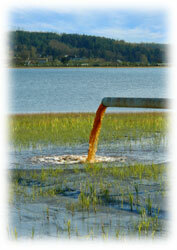 This includes non-stormwater discharges containing oil, grease, detergents, degreasers, trash, or other waste materials. PLEASE NOTE: The discharge of pollutants into the street, gutters, storm drain system, or waterways - without a Water Quality Control Board permit or waiver - is usually prohibited by local ordinances. Do . . . Dispose of small amounts of washwater from cleaning building exteriors, sidewalks, or plazas onto landscaped or unpaved surfaces provided you have the owner's permission and the discharge will not cause flooding or nuisance problems, or flow into a storm drain. Do Not . . . Discharge large amounts of these types of washwater onto landscaped areas or soil where water may run to a street or storm drain. Wastewater from exterior cleaning may be pumped to a sewer line with specific permission from the local sewering agency. Do . . . Check with your local agency's policies and requirements concerning waste water disposal. Water from many outdoor cleaning activities may be acceptable for disposal to the sewer system. Do Not . . . Pour hazardous or toxic materials into the storm drain or sewer system... properly dispose of it instead. When in doubt, contact your local sewering agency! The agency will tell you what types of liquid wastes can be accepted. The surface being washed is free of residual oil stains, debris and similar pollutants by using dry cleanup methods (sweeping, and cleaning any oil or chemical spills with rags or other absorbent materials before using water). Washing is done with water only - no soap or other cleaning materials. You have not used the water to remove paint from surfaces during cleaning. Do Not . . . Dispose of water containing soap or any other type of cleaning agent into a storm drain or water body. This is a direct violation of the state and/or local regulations. Because wastewater from cleaning parking areas or roadways normally contains metallic brake pad dust, oil and other automotive fluids, it should never be discharged to a street, gutter, or storm drain. Do . . . Understand that the mobile auto detailers should divert washwater to landscaped or dirty areas. Note: Be aware that soapy washwater may adversely affect landscaping; consult with the property owner. Residual washwater may remain on paved surfaces to evaporate; sweep up any remaining residue. If there is sufficient water volume to reach the storm drain, collect the runoff and obtain permission to pump it into the sanitary sewer. Follow local sewering agency's requirements for disposal. Do Not . . . Dispose of left over cleaning agents into the gutter, storm drain or sanitary sewer. If you must use soap, use biodegradable or phosphate free cleaners. Avoid use of petroleum based cleaning products. Although the use of nontoxic cleaning products is strongly encouraged, do understand that these products can still degrade water quality and , therefore, the discharge of these products into the street, gutters, storm drain system, or waterways is prohibited by local ordinance and the State Water Code. Note: When cleaning surfaced with a high pressure washer or steam cleaning methods, additional precautions should be taken to prevent the discharge of pollutants into the storm drain system. There two methods of surface cleaning, as compared to the use of a low pressure hose, can remove additional materials that can contaminate local waterways. A thorough dry cleanup before washing (without soap) surfaces such as building exteriors and decks without loose paint, sidewalks, or plaza areas, should be sufficient to protect storm drains. However, if any debris (solids) could enter storm drains or remain in the gutter or street after cleaning, washwater should first pass through a "20 mesh" or finer screen to catch the solid material, which should then be disposed of in the trash. Sand bags can be used to create a barrier around storm drain inlets. Plugs or rubber mats can be used to temporarily seal storm drain openings. You can also use vacuum booms, containment pads, or temporary terms to keep wash water away from the street, gutter, or storm drain. Special materials such as absorbent, storm drain plugs and seals, small sump pumps, and vacuum booms are available from Ultimate Washer, Inc 866-858-4982.